Gently press a popsicle stick into the each slice of fruit. 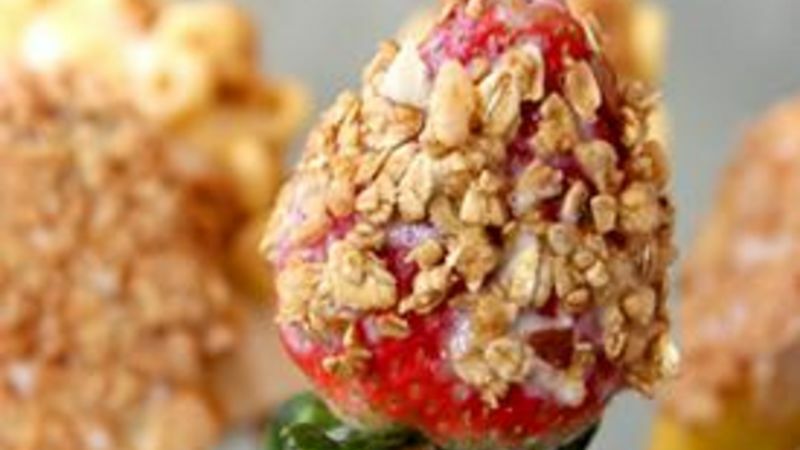 Dip each strawberry into the vanilla yogurt, then roll into granola. Transfer to a large parchment-lined, plastic container. Dip each mango into the Pina Colada yogurt. Roll into crushed Cinnamon Toast Crunch™ then transfer to parchment-lined plastic container. 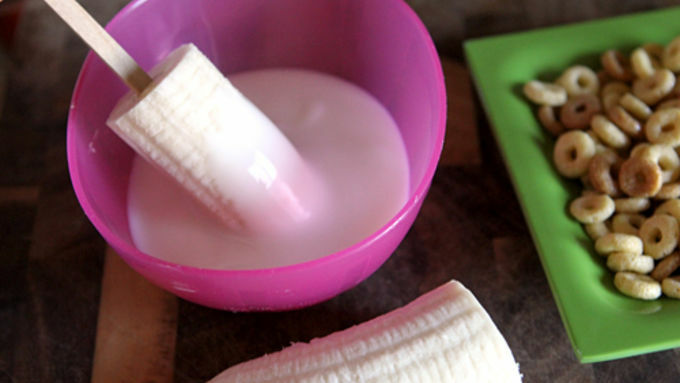 Dip each banana slice into the Boston Cream Pie yogurt, then roll in Dulce de Leche Cheerioes™. Transfer to parchment-lined container. Place the container in the freezer until fruit is frozen, about an hour and a half. Serve and enjoy! Just in time to satisfy New Year's resolutions: Grab a pop and get snackin' the right way with these incredible fro-yo-fruit pops! They've begun, haven't they? The classic beginning of the year resolutions where we promise ourselves we'll drop a few pounds by picking up fruit and veggies instead of chocolate bars and ice cream. Have no fear! With this crazy-indulgent Frozen Fro-Yo Fruit on Sticks recipe, you'll feel like you're eating something naughty, even though these treats are downright nice! Because these treats are so easy to make but require freezer time, I suggest you make a batch of several flavors. That way, you'll have a bunch of options to choose from whenever your sugar cravings hit! Now, go out there and keep at least one of those promises you made to yourself for the new year!